10 postcards – on the front a 'pledge' to be signed to assert the insistence that the UK government deliver on their promise to take us out of the EU by the time the Article 50 notice ends. Note: these cards will be sent to you in an envelope, they are blank on the back for you to use as you wish – as a post card sent to someone or with a note as greetings card. To receive a single postcard addressed/sent to you just for signing/display, please see other listings. This is a pack of 10 post-card (blank on the back) – for you to send to friends to sign, or for you to sign and send to your MP showing your pledge to insist the government keeps its promise to leave the EU at the end of the article 50 notice period (11PM, 29th March 2019). With a nod to an arch opponent of tyrants Pierre Proudhon, his words are paraphrased and directed against those who would go back on their word and would fail to deliver the brexit they promised. Note: these cards will be sent to you in an envelope, blank on the back for you to write on, address, stamp etc. Brexit Pledge Card – holding the government to their word. 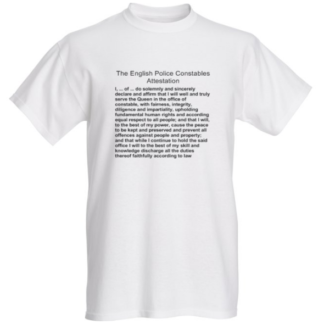 T-Shirt – The English Police Constables Attestation (Oath).